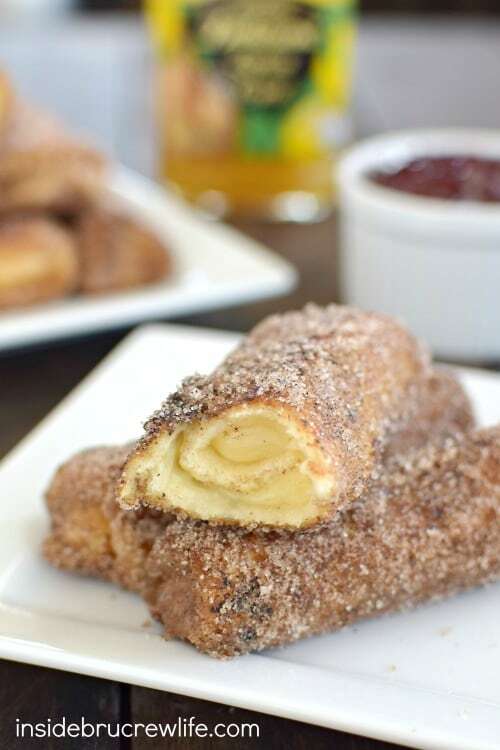 Lemon and cheesecake inside a crispy french toast roll is a delicious way to change up breakfast. 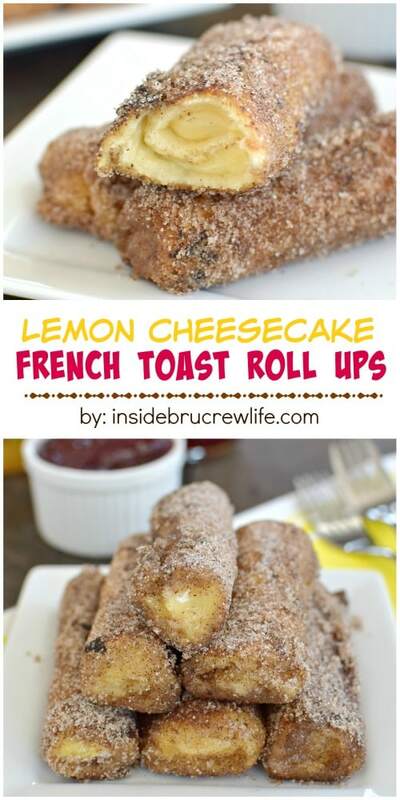 These Lemon Cheesecake French Toast Roll Ups are easy to make, but they look so fancy and pretty. Perfect for any brunch or breakfast parties you may be hosting. *Love these recipes? 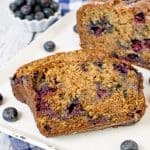 Be sure to sign up for the BruCrew email to have these recipes delivered to your inbox each day. 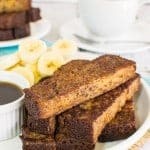 One of my favorite breakfast meals is french toast, but I do not make it that often. Me thinks that needs to change. Warm toasty bread drizzled with syrup should be a part of our breakfasts more often. Well, maybe part of our breakfast for dinner, since I’m not really a morning person. Something tells me frying bread in the early morning hours might result in someone getting hurt or breakfast being burned. Or both. Now I know what you are thinking. 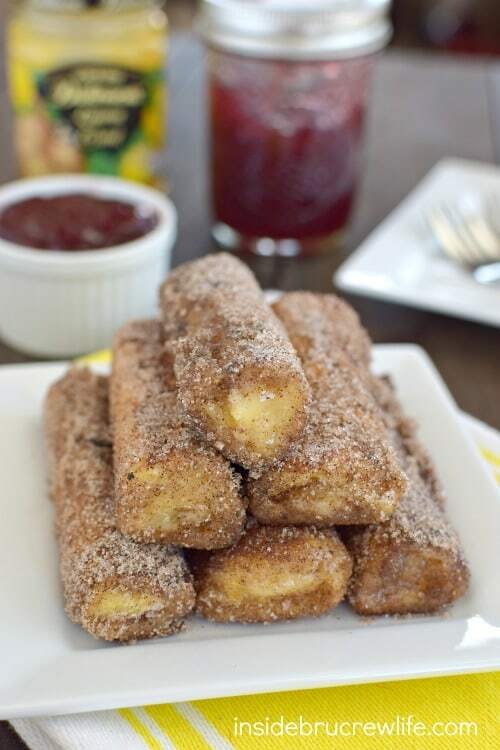 Ok, so when did you make these French Toast Roll Ups we see in front of us? I got all breakfast-y on a Saturday morning earlier this month. And by morning I really mean late morning…ok, fine it was closer to lunch time. French toast for lunch is totally acceptable on the weekends, right? When I got the urge to make french toast, I had a lightbulb moment to fill them before frying them in butter. My first thought was cheesecake because, well, duh cheesecake. It goes with everything. Then I saw a jar of lemon curd in the cupboard, and these Lemon Cheesecake French Toast Roll Ups were born. And bonus, it only uses half a jar of lemon curd, so get your spoon ready to eat the rest. Oh, wait. Maybe I’m the only that does that? These really are easy to make, but I have a few tips for you to remember as you give them a go in your kitchen. I was really going to take a few step by step pictures, but I would have to have another set of hands to do that. So I might need to have a baking assistant on days like this. 1. Cut off the crusts on all the bread slices. Then roll each piece of bread flat with a rolling pin. 2. Mix together the cream cheese and lemon curd and spoon a little bit along the short end of a slice of bread. Carefully roll it up and set aside. Repeat 15 times. 3. Dip 3-4 at a time in the egg mixture and place in a pan with 1 Tablespoon melted butter. Keep the rest of the butter right there to add to the pan as needed. Make sure you keep rolling them around gently to get all the sides browned. 4. As soon as they are browned and done, roll them in the cinnamon sugar mixture. Serve immediately. These are best eaten fresh from the skillet! 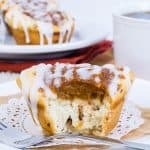 French toast filled with lemon cheesecake and rolled in cinnamon sugar makes an extra special breakfast. Trim the crust from the bread slices. Use a rolling pin to roll them flat. Whisk together the eggs and milk. Beat the cream cheese and 2 Tablespoons sugar until creamy. Stir in the lemon curd. Stir together the remaining sugar and cinnamon in a bowl. Spread a teaspoon of filling on the end of each slice of bread. Roll up carefully. Dip the rolls in the egg mixture. Fry in a pan with butter until cooked and browned on each side. Remove and roll in the cinnamon sugar mixture while warm. Serve immediately. Wow. I want this for breakfast on my birthday. Or today would be good, too! But I’m like you, can’t fry so early. So it’s going to be breakfast for dinner VERY soon. Sounds to me like dinner at your house is going to be very good 🙂 Let me know how you like it!!! HOLY YES PLEASE! We are all about french toast, and I am ALL x 2 about cheesecake. So putting them together? Amazing! And breakfast is totally acceptable at later times in the day…I’m sure these are an amazing dinner 😉 Pinned! I’m so glad breakfast is acceptable all day long 🙂 Thank you so much for the pin love! Oh, that lemon curd…it is so dangerous to have in my house! 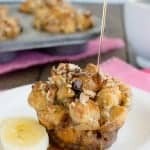 I hope you enjoy these french toast rolls! You little genius! 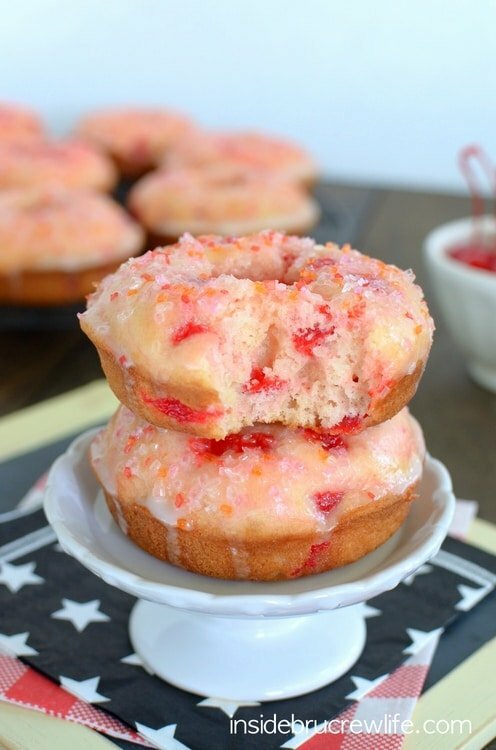 These look heavenly. Pinned! How gorgeous are these roll-ups?! Love this, Jocelyn! Lemon and cheesecake for breakfast is right up my alley. Pinned! Yay for cheesecake finding it’s way to breakfast too, right? Thank you for sharing! You had me at Cheesecake, then French Toast and OMG you said Lemon!!! Holy yum! I love lemon curd and cheesecake. I’ll take the whole batch of roll ups please! Genius! Absolute genius! 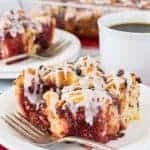 Love the combination of flavors in this amazing breakfast treat! Thank you! It was a hit here too!! You are genius Jocelyn! 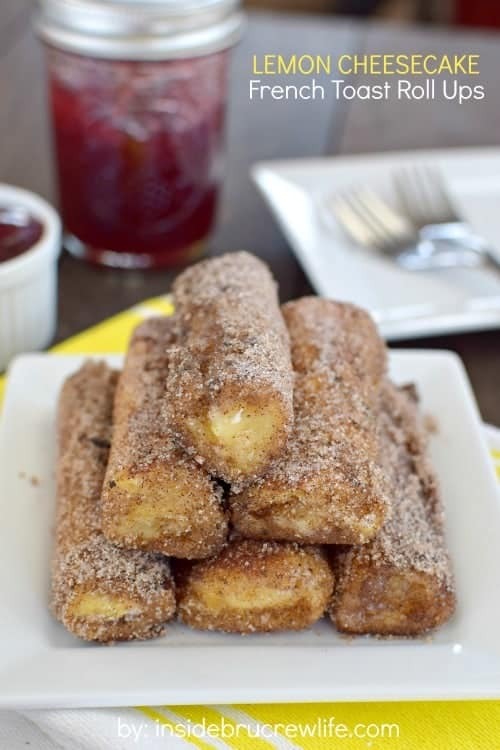 I heart breakfast and these Lemon cheesecake french toast roll ups look perfect! I just need my big mug of coffee and I am set! Pinned! These are the perfect special breakfast for out of town guests. I hope they enjoy them! Breakfast for lunch is OK anytime! These look so delicious. 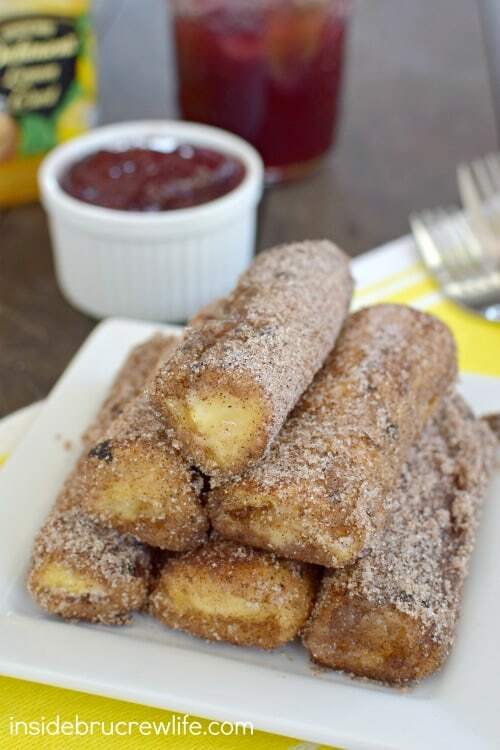 These french toast roll ups are the best of everything! 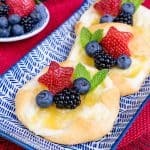 What a great idea to add the lemon curd. I am a huge fan of anything with lemon! Ok. Yum and double Yum!!! Love the french toast. Love the lemon. Love the cheesecake part of it. Love, Love, Love this! You are so talented! Oh man, these look amazing! I’ve got to make them soon! French toast with a facelift! yum!! You can’t go wrong with lemon anything! These would be a hit with my family! Hi, Polly. Lemon curd is actually different from lemon pie filling. It is thicker…think lemon meringue pie. Haha! I guess that means it is like pie filling, but different. I have seen the lemon curd in the baking aisle at my grocery store and by the jams and jellies in Walmart. Hi. 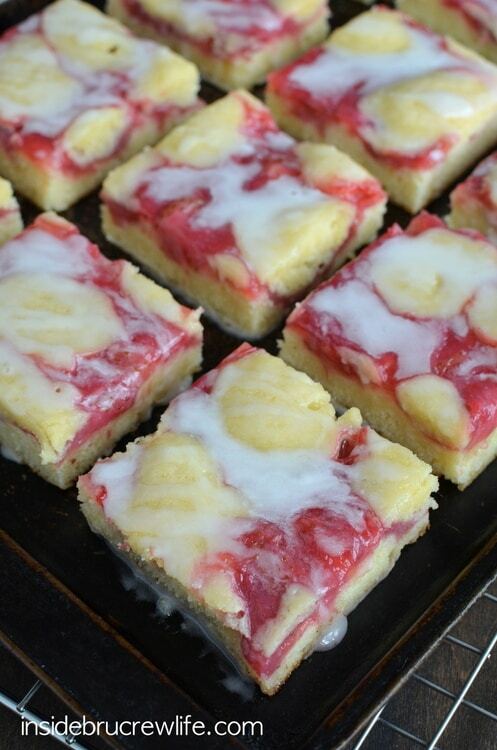 I would love to make these for a breakfast staff meeting, so I would need to make them the day before. You mentioned serving them right out of the skillet….have you ever had them the day after or do they get soggy? Thanks. I definitely do not recommend eating these as leftovers. They really are best served hot and fresh.